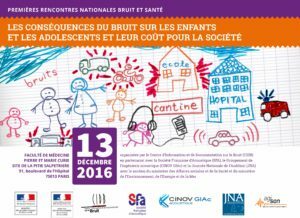 Boët StopSon will exhibit on Tuesday, December 13, 2016, at the 1st National Noise and Health meetings organized by the Center for Information and Documentation on Noise (CIDB) in partnership with the French Society of Acoustics (SFA) Acoustic engineering (CINOV GIAc) and National Hearing Day (JNA) with the support of the Ministry of Social Affairs. This conference will be held at the Faculty of Medicine PIERRE and MARIE CURIE, Pitié Salpêtrière site: 91, boulevard de l’Hôpital – 75013 PARIS. Theme of this day will be “Consequences of noise on children and adolescents and their cost to society”.